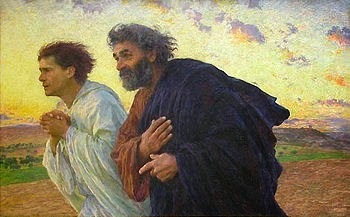 One of my favorite paintings is called “The disciples Peter and John running to the tomb on the morning of the Resurrection” by Eugene Burnand, 1898. I have a print of it hanging on the wall in my bedroom. The two Marys had seen the empty tomb, seen an angel, and seen Jesus, and they hurried to tell the disciples. Stunned by the news, Peter and John ran to the tomb to see for themselves. What must have gone through their minds as they rushed to the tomb? Was Jesus really alive? How can this be? Did the woman really see him? Did someone steal his body? Where is he? When they arrived at the tomb, they saw the stone rolled away, they held the strips of linen in their hands, and they believed for themselves. They knew Jesus was alive, but where was he? They returned to their homes with excitement and puzzlement. Where was he? Finally that night Jesus appeared to the disciples who were all together, locked in a house in fear for their safety. What an amazing night that must have been! They saw the marks on his hands and feet. They saw the scare on his side. They saw the resurrected Jesus. Jesus must have reminded them that he had told them he would die and rise again in three days. He must have reminded them of his purpose in coming to earth and dying on the cross. He must have begun to prepare them for the days, weeks, months, and years ahead. And he told them the Holy Spirit would be coming on them in power. Jesus Christ is the Savior of the world. He died on the cross and rose again. He ascended to heaven, and he sits at the right hand of the Father. He is alive!